were hoping for some well deserved peace and rest, enjoyment and exploration for a week or so, before getting on with the chores. Since leaving St. Martin, we had to keep moving to stay ahead of the hurricanes and Grenada would be our final destination this season. No rest for the weary, though, and soon enough Grenada turned into another St. Martin for us with many projects, stress and business related subjects. 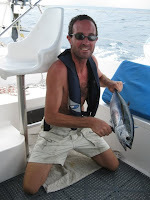 But first, we enjoyed our freshly caught tuna! Checking into Hillsborough on Carriacou didn’t pose any problems and after a quick stop at Sandy Island for some snorkeling, we arrived in Tyrell Bay, surprised at the amount of sailboats. Wherever we stopped along the island chain south, there were just a few boats. The majority of cruisers had made their way to safer Grenada or Trinidad well before July started. We knew of a few boaters interested in a Wirie, so instead of relaxing, we started building another set of our WiFi devices (www.thewirie.com). 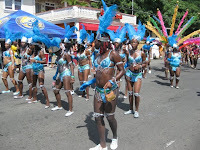 Then, we heard about carnival in St. George’s, the capital. If we left that weekend, we would be in time for the big celebrations on Monday and Tuesday. So we did! Before we realized it, we had arrived on the island of Grenada. Anchoring outside of St. George’s proved to be a bit troublesome for us. 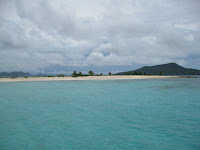 The holding (old pieces of coral) was very poor and we dragged each time we tried to set our anchor with the engines. It became a bit frustrating, looking at other boats getting the job “done” in five minutes and leaving into town. Luckily, there was no wind for a few days. After two hours, we finally got settled, but the day was gone. Our South African friend Frik, who we met in Luperon (Dominica Republic) last year, has his sailboat in the capital and it was great catching up with him. Carnival itself was very loud, day and night, but the parades were all right. The atmosphere was festive and the costumes skimpy and less elaborate than the ones we watched in St. Maarten. St. George’s is a good place to stock up on groceries and other products at better prices than the rest of the country. The food in Grenada is more expensive than we expected. One thing, fresh fish, is delightfully cheap, because it is subsidized by the government. 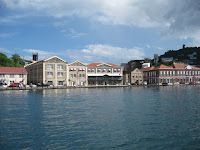 Another highlight about the capital is its waterfront along The Carenage. Called “One of the prettiest harbors in the Caribbean” in many a guidebook, the collection of colorful, old fashioned buildings looks attractive indeed. One of the reasons we wanted to spend most of hurricane season on the southern coast of Grenada is its many suitable anchorages. Prickly Bay is the most convenient one, with a marine store, a boat yard, a marina, easy access to buses into town, a big beach, and cheap happy hours. 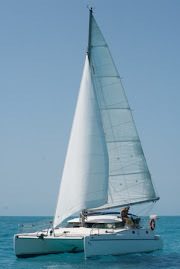 The anchorage does get rolly and crowded at times, which is when you move to another area. 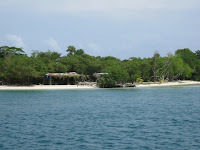 Hog Island anchorage is very protected and relaxed, with an empty beach on the island and Roger’s Beach Bar, when he’s around with a cooler full of goodies. Our favorite anchorage is around the corner from Hog Island, just into Clarke’s Court Bay. It is quiet, easy access to shore provides walks around Hog Island or to a secluded beach, the water is clear and internet is available with the Wirie! As in all anchorages around here, the water is pretty deep. Love the name of your blog. Enjoy all Grenada has to offer.. hopefully it's a quiet hurricane season.